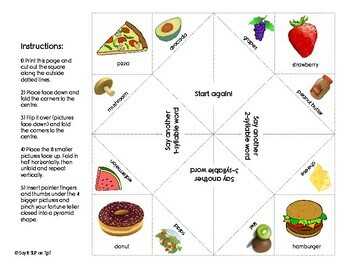 This printable fortune teller is a low-prep, fun activity for helping children develop the phonological awareness skill of segmenting words into syllables. It includes examples of 1-, 2-, 3-, and 4- syllable words and provides numerous opportunities to teach and practice syllable segmentation, or breaking words down into "beats." 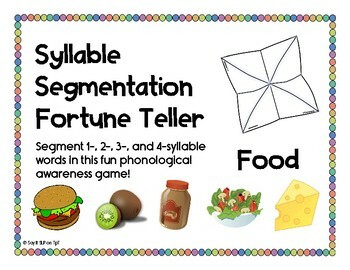 The word-to-syllable segmentation is paired with the visual and motor cues of opening the fortune teller in both directions, providing multi-modal learning for this key pre-reading skill. 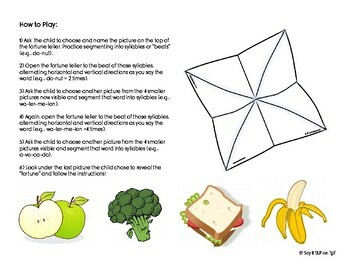 Support your child's literacy development and love of food with this fun, low-prep activity!